This is one of my favourite dry flies to use when it is a dark and miserable day. I took eight fish for 33lbs in the mid 1990's with this fly on Rutland Waters. Obviously it is taken by trout for the emerging buzzer. 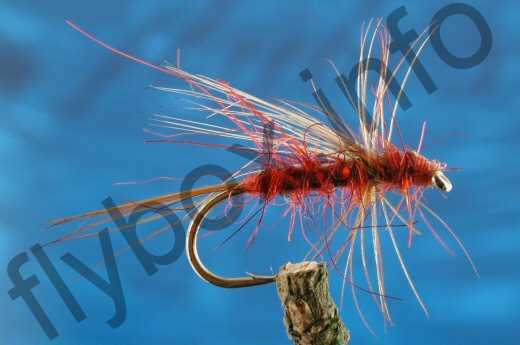 An orange version of this little dry fly may also be worth having ready in the flybox. Keep your leader quite fine - no more than 4lb breaking strain and clear in colour. It is quite amazing how trout take just at the precise moment of emergence. Silk : Black Uni-thread 8/0. Body : Fiery claret SLF. Rib : Fine red tinsel. Wing : A few strands of white deer hair. Hackle : Two turns of red game. Head : Whip finish with black tying silk and clear varnish.